There is something magical that happens when your cooking and your reading and your weather all line up together. It’s 14 degrees today (for the high!) and it’s snowing big, fat flakes in every direction (for the second time this week!). With pure delight, I write this because it has been a very long time coming. Winter weather in the South is never usually this charismatic, so for an eternal snow lover like myself, these past few days have been absolutely fantastic. I’m eighty pages into Ruth Reichl’s latest cookbook, My Kitchen Year, where it is also winter. 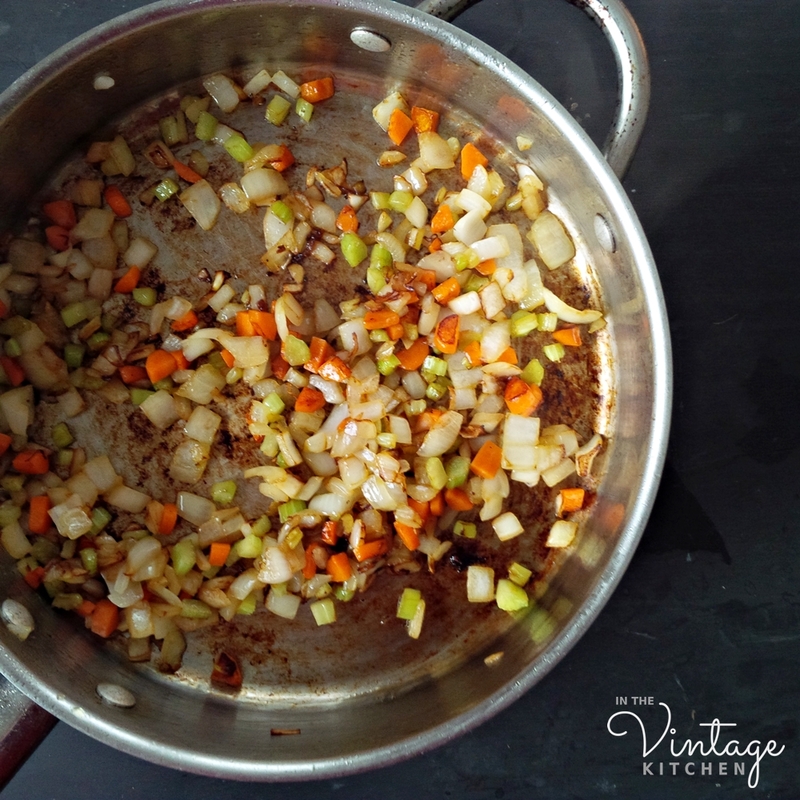 Ruth is writing about the freezing temperatures and the snowy landscape in upstate New York and how the seductive aromas of long-simmering onions and butter and chicken and wine have the ability to both warm the stomach and the spirit. Today, its Ruth’s birthday, so we thought it would be fun to make one (or two) of her recipes to compliment both the winter landscape we are reading about and the winter landscape we are actually experiencing. 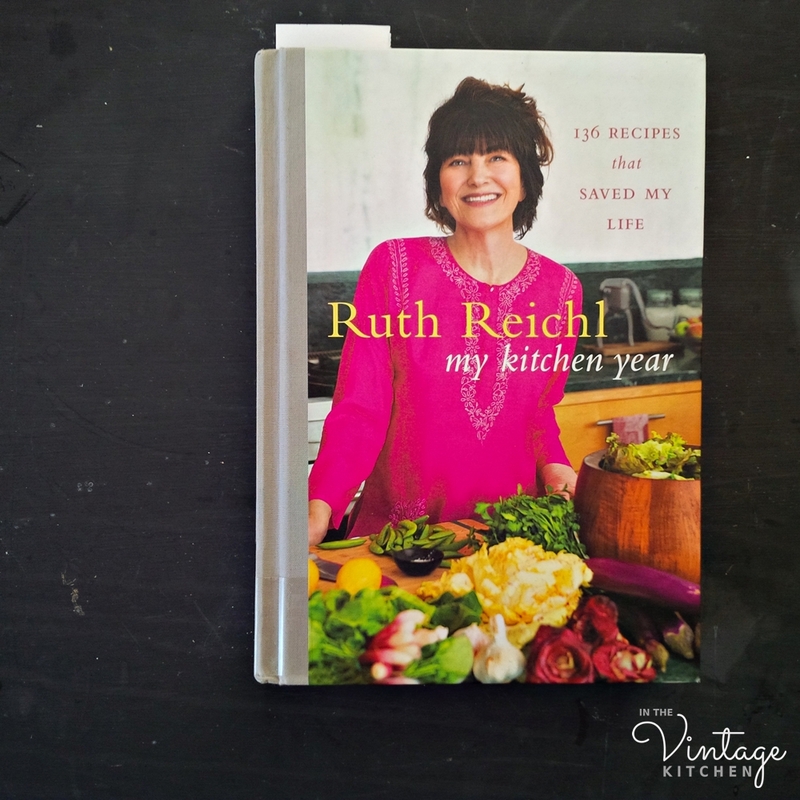 If you are unfamiliar with Ruth Reichl, she has been around the food scene since the 1970’s as a writer, chef, food critic, host and magazine editor in all realms of media from print to television to radio. I first heard of her when I was a teenager, riding up the West Side Highway with my dad and my sister. At that point, in the early 1990’s, Ruth was the food critic for the New York Times. Her restaurant reviews would air on the morning commute segment of the local classical music station favorited by my dad as he battled his way through New York City traffic. The spot, sponsored by Veuve Clicquot, contained her latest restaurant review and was, to put it politely, very honest. More often than not, she disliked a restaurant or the food or the service and she wasn’t afraid to say so. She’d sign off every review saying “I’m Ruth Reichl” and my sister and I used to mimic her voice in the car. 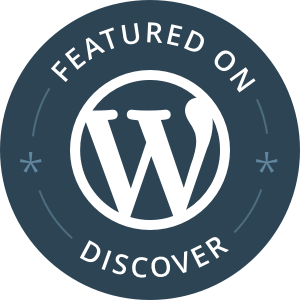 Growing up in New York, where most endeavors get scrutinized on a daily basis, I was used to reading about reviews and hearing criticisms on a variety of subjects when it came to the creative arts and emerging trends. But the way Ruth talked about food and service and presentation was elevated to a whole new level of description. Her words were candid but also sophisticated and humorous when it came to observation. Each review was a brave, opinionated tale of her own experience that flew through the air seemingly without care as to whom it might affect at the restaurant of concern or what impression it might make of herself. The three us, my dad, my sister and I thought she was pretty audacious. We used her name as our own descriptive tool when it came to trying out restaurants in the city…”Well it’s no Ruth Reichl…” and all of us made special note to remember the names of the restaurants she lauded because certainly, they didn’t come around often. Fast forward a decade and a half later, I spotted Tender at the Bone, a memoir she had published in the late 1990’s, for sale at an outdoor book stall in Philadelphia. I bought it, took it home and immediately called my sister. 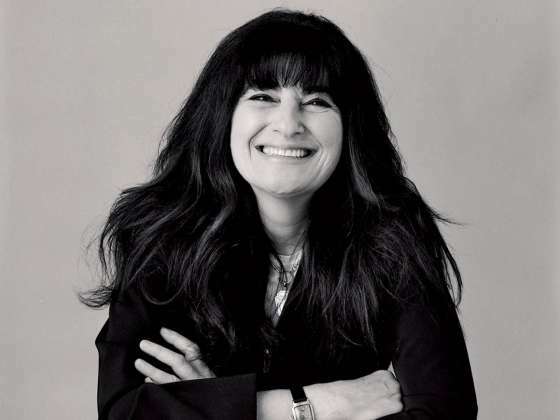 “I’m Ruth Reichl” she said and we both laughed over memories of driving with our dad on the West Side Highway. And then I actually read the book, which was marvelous and to my surprise, very vulnerable and humbling. There was no restaurant critic in her voice in these pages. It was all heart and humanity when it came to discussing family, food and growing up. And there were recipes – good ones, homey ones that everyone enjoyed – brownies, deviled eggs, pot roast, fruit tarts etc. I loved it so much, I immediately read her other two books which followed – Comfort Me With Apples and Sapphires and Garlic. Those books covered her young adult years in food, job and relationship explorations and then those famous years as a restaurant critic when her job was no easy slice of pie. These stories slashed through all my pre-conceived notions of who I thought Ruth was when I was a teenager and she was sponsored by a champagne company. And most importantly her books were my first introduction into reading food memoirs… not so much for the recipes but for the stories behind them. For a long while, lots of things coming out of my kitchen stemmed from Ruth either in the form of recipes from her books or ones from her magazine, Gourmet, where she held down the fort as editor-in-chief. The food she featured always contained simple elegant ingredients that looked pretty on a plate and satisfied all the senses in a most appealing way. Even though I’ve never met her, Ruth has been a reliable companion in my kitchen, which brings us back to this post featuring her birthday celebration on today’s cold winter’s day. I selected these two recipes because, like the lively lady herself, they are full of depth and require some care and attention in a fun and fulfilling way. Also, they make the kitchen smell like heaven. 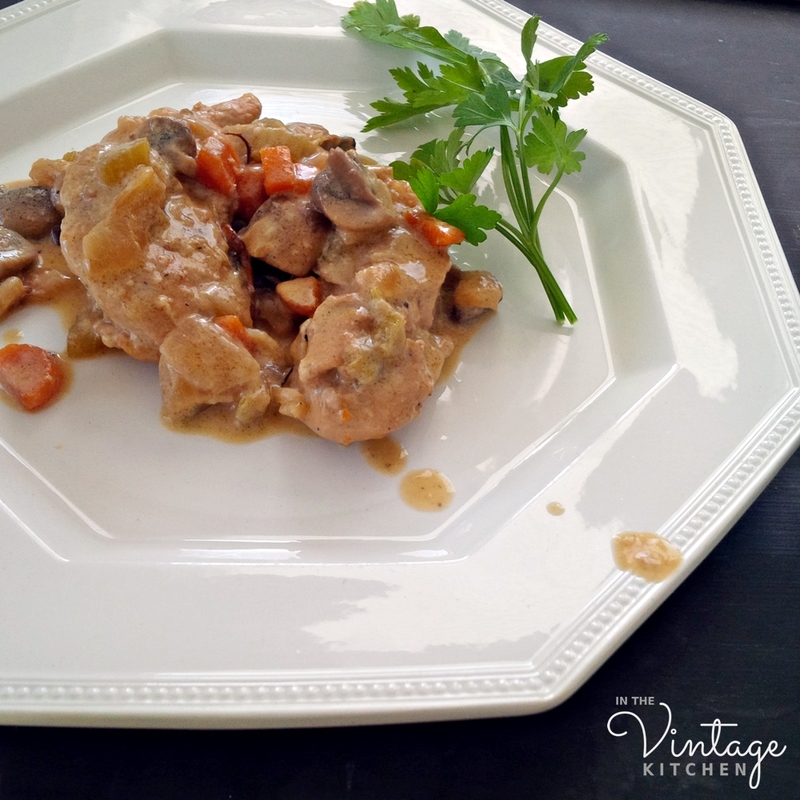 The vintage recipe, Show-Off Salad (aptly named because you prepare the whole thing at table in front of your fellow diners) is from Tender at the Bone and the classic yet modern day recipe Chicken Fricassee is from her latest cookbook My Kitchen Year. 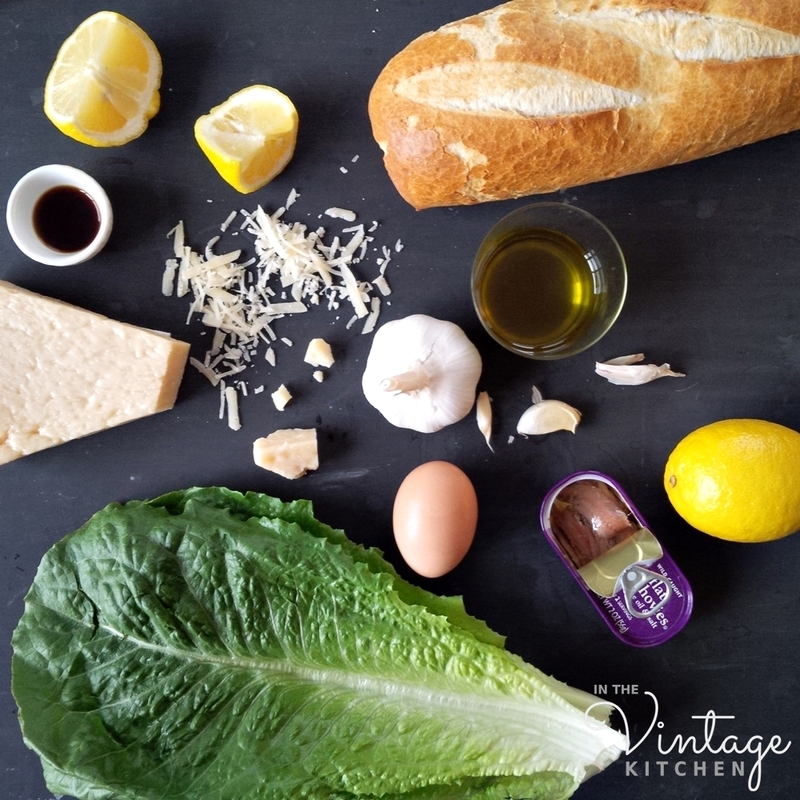 Both recipes are a great representation of my memories of Ruth – they might seem a little fussy at first but at their core, they are just real, simple and basic dishes that have universal appeal. Hope you enjoy them just as much! 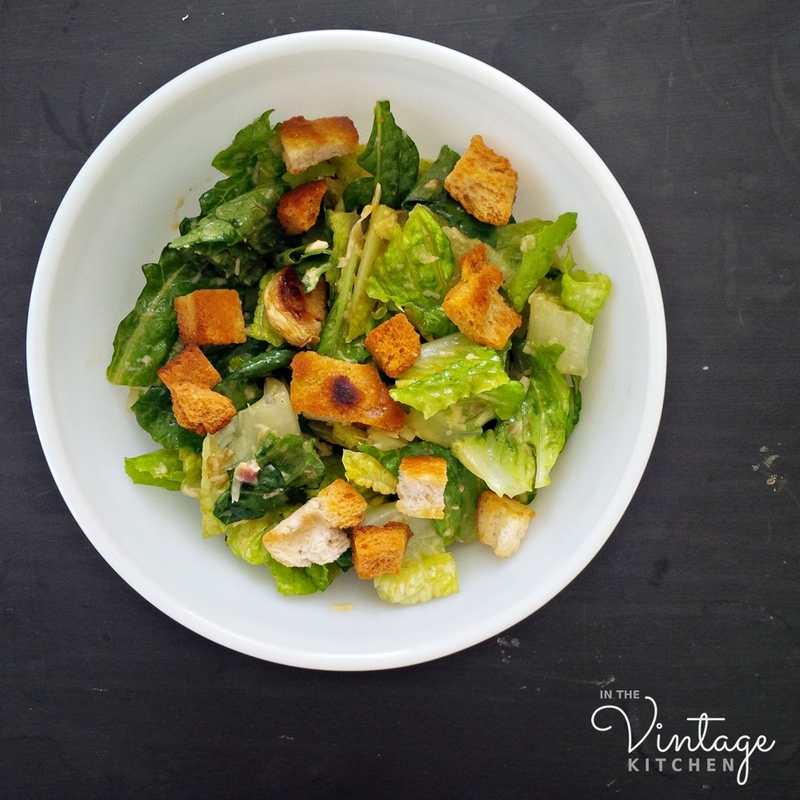 Make the croutons. Crush one clove of garlic and add it to two tablespoons of olive oil in a medium size pan over medium heat. Add the bread cubes and saute until the bread is crisp and golden on all sides. Drain on a paper towel and set aside. Set a small pot of water to boil on the stove. Once the water is boiling, coddle the egg by dropping the entire egg (in its shell) into the water and boiling it for 1 minute. Remove the egg from the water and set aside. When you coddle an egg for a salad dressing like this you are heating it (but not cooking it) really fast just below the boiling point, so it’s important to use a trusted organic farm egg as opposed to generic grocery store eggs for salmonella reasons. Uncooked eggs are dangerous carriers of bacteria, so make sure your eggs are from clean, natural and reputable sources. Otherwise skip the egg part altogether. Wash and dry the lettuce and then tear into bite-sized pieces. This next step can be done in your kitchen – or in front of guests, it doesn’t matter either way. If you prepare it in front of guests, put all the salad components on a tray and carry it out to the table to make. Peel the remaining clove of a garlic, cut it in half and crush one half in the bottom of a big salad bowl. Add lettuce leaves and remaining olive oil. Toss thoroughly until each leaf is coated. Add the Worcestershire, and then the salt and pepper to taste. Break the egg over the lettuce and toss until leaves glisten. Stick a fork into the lemon half and squeeze the juice over the salad. Toss the leaves until the dressing begins to look creamy. Then toss in the anchovies and mix again. Adjust the seasonings (salt, pepper, lemon juice) if need be before adding the cheese and croutons. 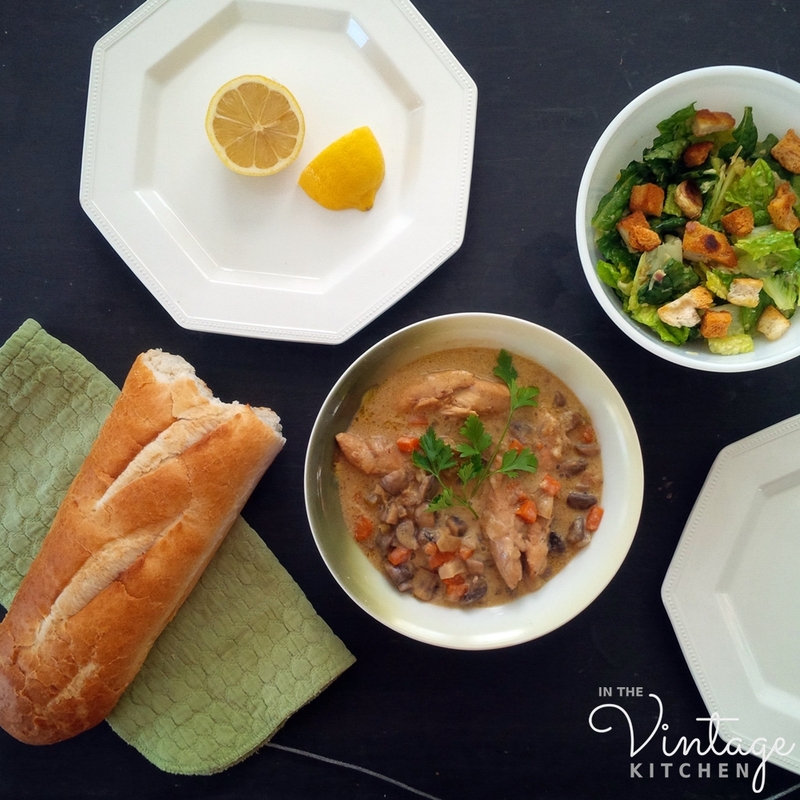 Now that the salad is ready, consider serving it on individual salad plates rather than next to the Chicken Fricassee which is saucy and is more suited for the crunchy bread as far as plate companions go. In addition to a dinner side, this salad also makes a lovely meal just on its own too. If you choose the skinless boneless cutlet version, this is what your chicken will look like after the quick saute. 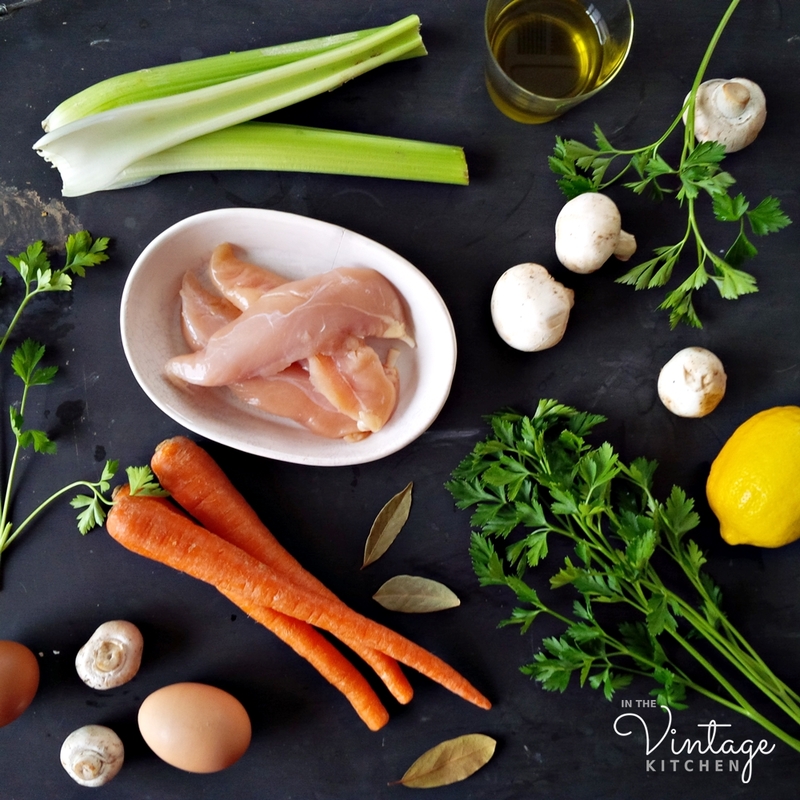 In the same pan where you cooked the chicken, add the onion, carrots, and celery and cook until vegetables are fragrant and soft- about 10 minutes – stirring occasionally. Add two tablespoons of flour and cook, stirring continuously until all the fat has been absorbed. Add the white wine and stir until the liquid has thickened slightly. Return the chicken to the pan. Add the broth. Add a few sprigs of parsley, salt and pepper and a bay leaf. Bring to a boil and then reduce to a simmer. Partially cover and cook for about 30 minutes – 45 minutes until chicken yields when you pierce it with a fork. In a separate pan, melt two tablespoons of butter (or two tablespoons of olive oil) and saute the mushrooms. Salt to taste and set aside. When the chicken is ready, remove the lid and remove the chicken to a separate plate. Discard the herbs. Let the sauce mixture simmer for few more minutes. 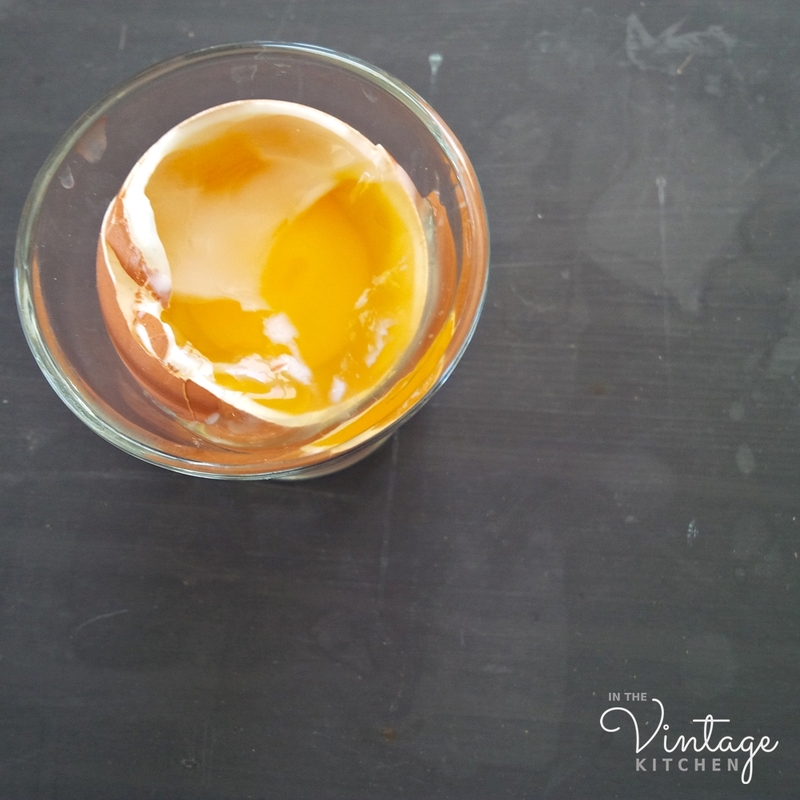 In a small bowl, whisk the egg yolks and cream together. Slowly add a small amount (about 1/2 cup) of the hot liquid to the eggs and cream and whisk quickly to temper it. Stir the egg mixture into the pan mixture, stirring constantly for about a minute. Add the mushrooms and the chicken. Add the juice of the lemon. Add one tablespoon of butter (or one tablespoon of olive oil). Remove from heat and serve in a large bowl for the table or plate individually. Pool extra sauce around the chicken. Garnish with fresh parsley sprigs. We served this with warm crunchy French bread, the show-off salad and chilled Pinot Grigio. 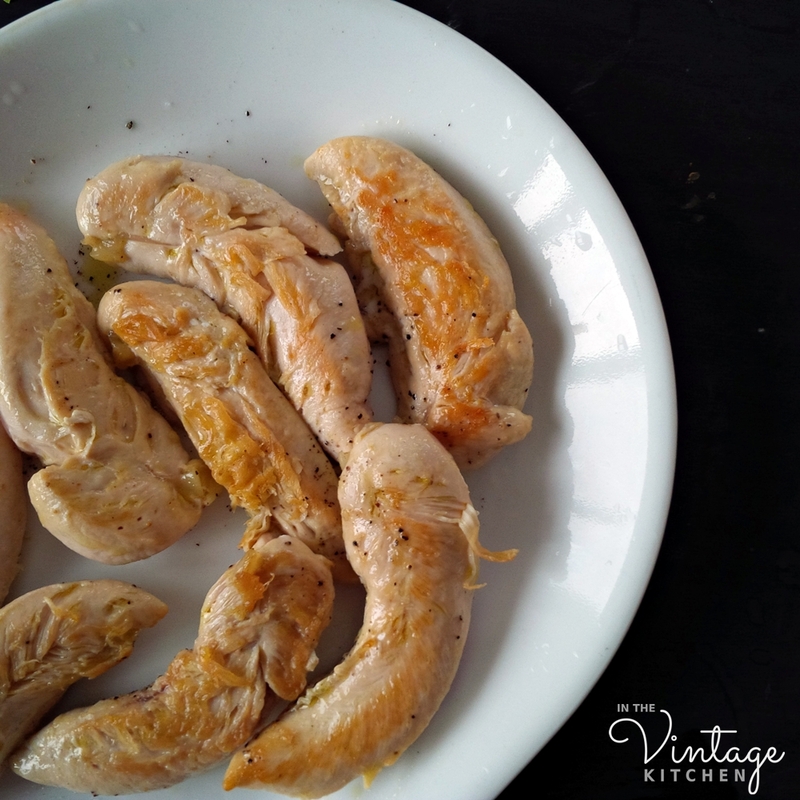 In My Country Year, Ruth said this recipe reminded her of when she was living on an island (Ile d’Oleron) off the coast of France in the 1960’s. This recipe will forever now remind us of the back-to-back snow days that finally arrived after many years of anticipation. Cheers to good memories, good cookbooks, and long acquaintances. 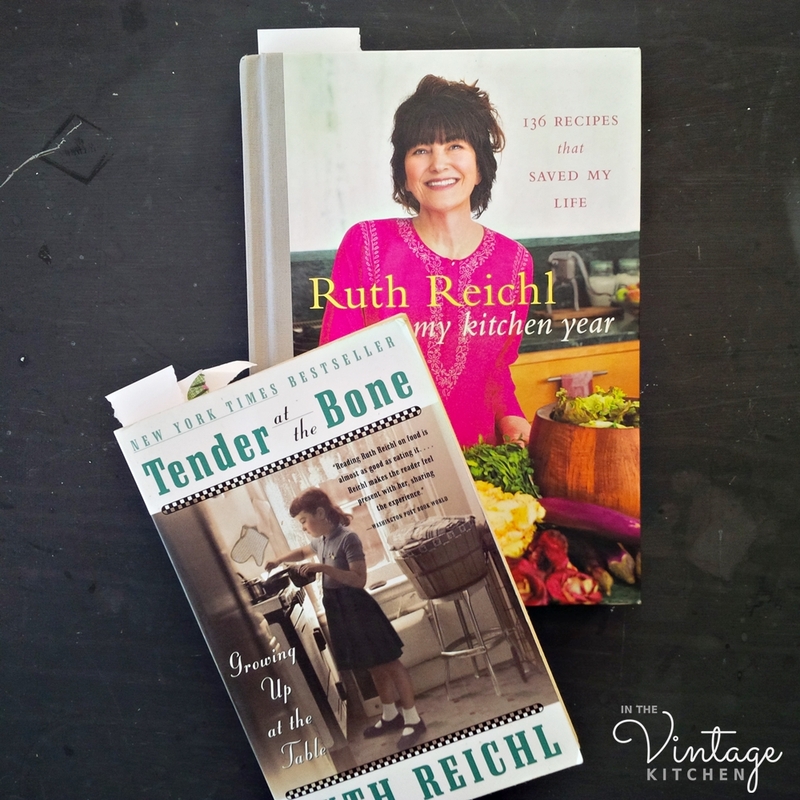 Happy birthday Ruth Reichl! 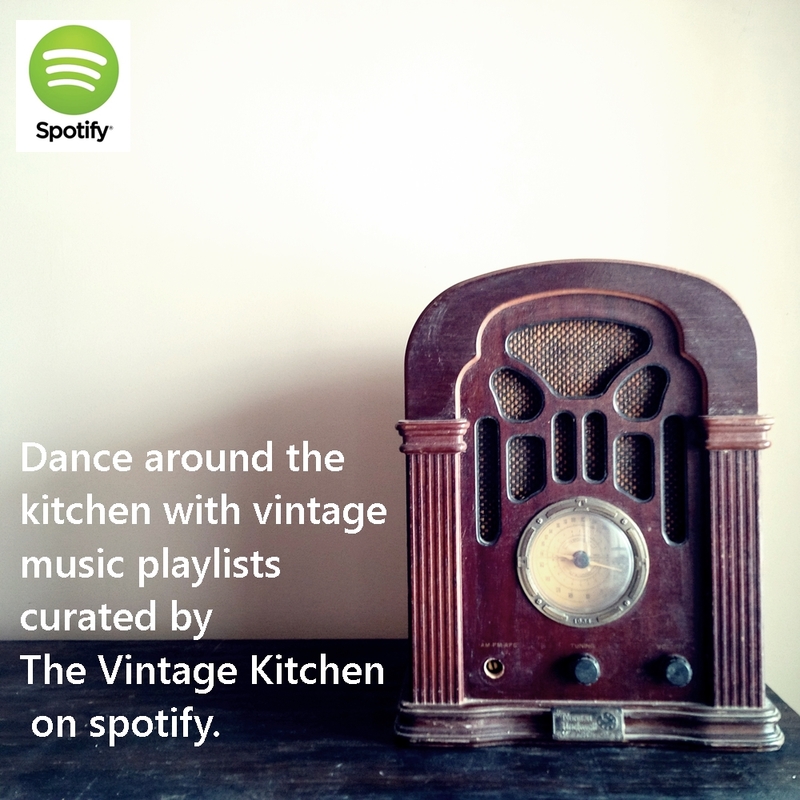 Follow The Vintage Kitchen on Instagram! 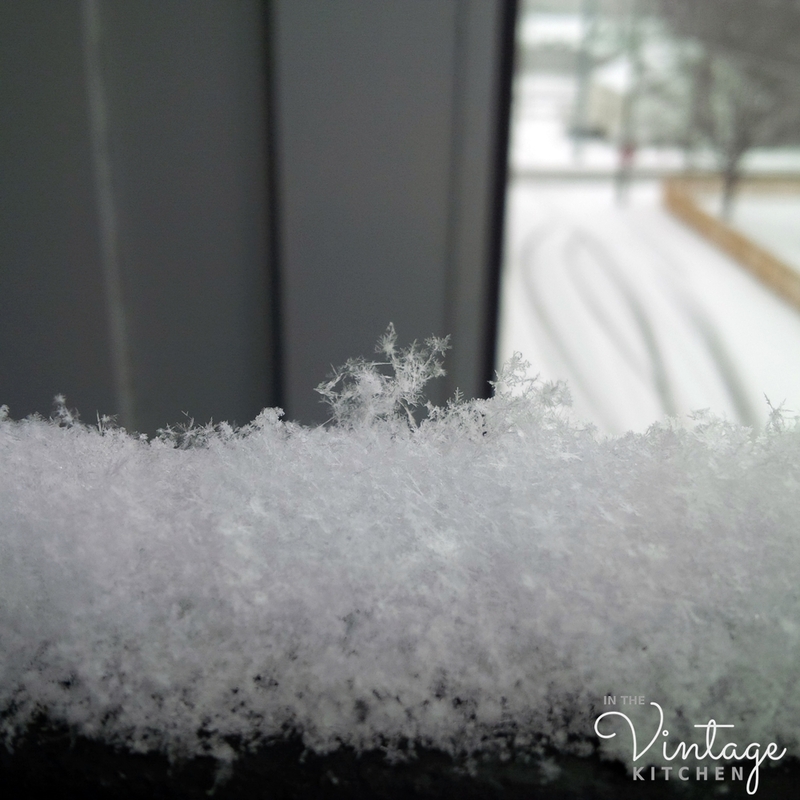 Sugar Spun Success: It’s the 1920’s, It’s Wilton and It’s the Winter Snowflake Cake! 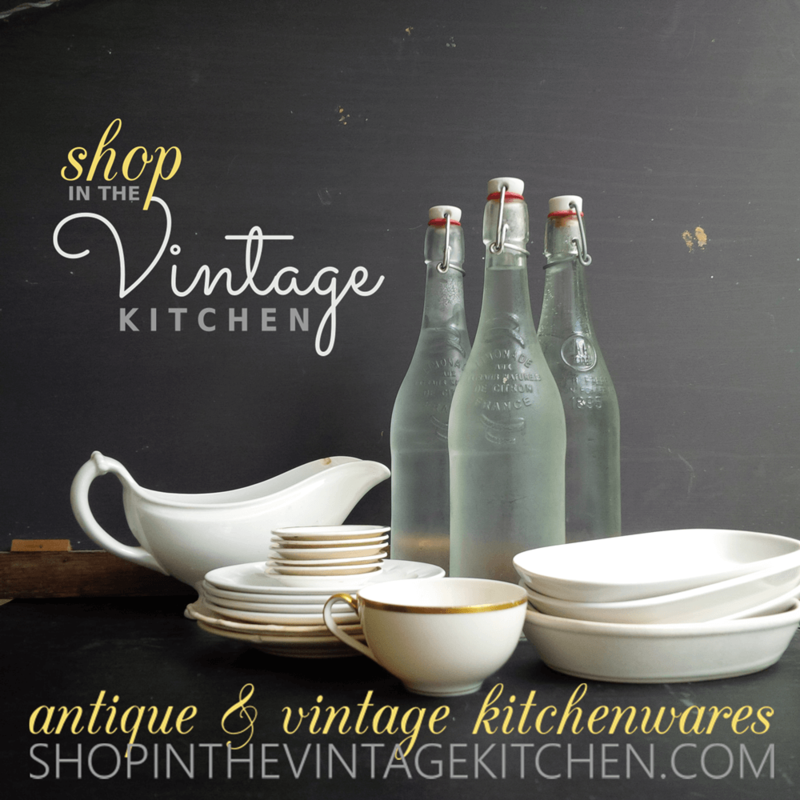 Visit The Vintage Kitchen on Pinterest!